There are two protagonists in the novel. The first one is Winter Ihernglass, a common rank and file trooper in the Vordania army who is eventually given a small command of her own. A significant amount of her character development is spent on this aspect of her story, learning how to be a leader, even if that is only for a small handful of men. What complicates matters for her though is that she is a woman in an exclusively male army, and no one is aware of her secret, not even her closest subordinates. She has left a rough life of exploitation behind her and in the army she seeks to carve out her own life on her own terms. The second protagonist is Captain Marcus D’Ivoire, the second-in-command of the Vordanai army that we see in this novel. In the grand scheme of things he is just one among many, but here, he fulfills an important role, acting as confidante for the newly-arrived Colonel Vhalnich, who could not be more eccentric if he tried. Most of his character arc is spent exploring his relationship to Vhalnich and his relationship with his fellow Captains and the soldiers under his command. Suffice to say, the protagonists of The Thousand Names are quite an interesting pair. Django does well in approaching the story through them, giving the reader a very solid overall view of events as they happen, and really showing off the workings of the Vordanai army on march. They are both distinct, with their own voices, their own motivations, and at the same time they also work well together, which was quite thrilling for the brief moments that it happened throughout the novel. While Winter on her own provided to be quite a character, truthfully I was more awed by D’Ivoire, considering the predicament he is in, as well as being the intermediary between the army and the Colonel, all of which combines to form a really intriguing plot. And speaking of the plot, The Thousand Names is a long and involved story that often gets into the minutiae of things. It starts off with a very specific, very particular world-view, that of Winter. But then we immediately move into the territory where D’Ivoire starts to come into his own. And all throughout, the novel is a really fun ride. Along with the two primaries, Django also has a host of characters who assist Winter and D’Ivoire in their various adventures here. We have the aforementioned Colonel Vhalnich, the most entertaining character in the entire novel, and we have various men of the army, whether those on the same level of responsibilities as Marcus himself, or the more common troops, such as the ones directly under Winter’s command, or even anything in between. Each character, whether big or small, contributes to the overall story in a very different way. And that diversity is one of the best things about this book, by far, because Django is really good with the characterisation and because he makes all of them matter, no matter who. The novel has a slight bit of a rough start, but it picks up the pace quite quickly, thankfully. And once it gets going, it doesn’t really stop. The entire middle portion of the novel is taken up with a big pitched battle between the Vordanai and their enemies, the rebels of the Khandar colony who recently threw off the Vordanai yoke and are the primary antagonists of the story. Being a military fantasy novel, it was inevitable that we’d get to see a big battle like this, and while I think that Django spends a little too much time on it, he nevertheless handles it with panache. I really enjoyed reading details of the various tactics and strategies that the Vordanai came up with to counter the Khandari rebels. It added a ton of excitement to the story, and helped advance the character developments for Winter, D’Ivoire and Vhalnich, even though the latter doesn’t get a POV in the novel, sadly. And after that, the final third of the novel is just an unrelenting mass of revelations and counter-moves as we finally begin to learn just why Vhalnich is the one to arrive in Khandar to lead the Vordanai army there, and we also learn more about the larger setting, how the two cultures that we see presented here interacted with each other in the past. Suffice to say that The Thousand Names is a novel that is a very layered and deep novel. It doesn’t quite seem so in the beginning, but it rewards the persistent reader, because the payoff at the end is worth everything by the time you get to it. The story of these characters doesn’t end here of course, but we do get some good closure on most of the storylines that were introduced, and the ending in and of itself is really good. If you are looking for an all-through action novel, then you are looking in the wrong place with this one. Vhalnich is a character who keeps a lot of his cards close to his chests and he reveals them only when absolutely necessary. In many ways, this is a mystery novel, with Vhalnich being the main object of the mystery, as we learn over the course of the novel. 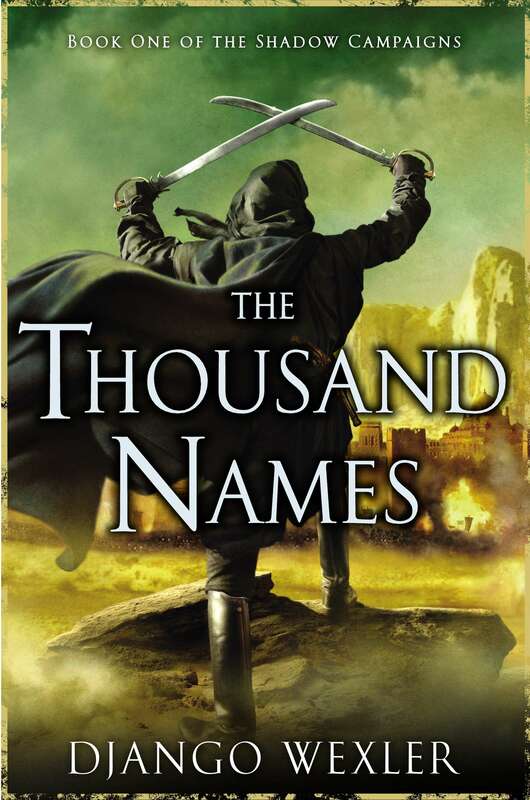 Ultimately, what matters is that The Thousand Names is a really fun novel. It has some great characters, a great plot and a really interesting magic system that comfortably sits on the fence between the typical fantasy magic system and something different. Posted on February 15, 2014, in Book Reviews, Review Central and tagged Ace/Roc Books, Book, Book Review, Demons, Django Wexler, Epic Fantasy, Fantasy, Janus bet Vhalnich, magic, Marcus D'Ivoire, Military Fantasy, Review, Review Central, Roc Books, The Shadow Campaigns, The Thousand Names, Winter Ihernglass. Bookmark the permalink. 4 Comments. I found some flaws in it, but really appreciated the “flintlock fantasy”, which fantasy needs more of.